Welcome to Luna Blu Cottage (Formerly known as No Shoes No Shirt No Problem), located in the town of Duck! This charming and quaint oceanside cottage is just 1500 feet from the beach and has designated parking at the private beach access lot down the street. Luna Blu Cottage is part of the exclusive Tuckahoe Neighborhood which allows your family and friends access to the community pool and tennis courts. Or just relax and enjoy the PRIVATE POOL AND BUBBLY HOT TUB after a long day on the beach. Luna Blu Cottage is a fun and bright beach cottage sure to keep spirits high and inspire relaxation. This cottage will comfortably accommodate eight with four bedrooms (One with 2 Twins, two Queen bedrooms, and one King master bedroom), two full baths, one half-bath and a washer/dryer for guests to utilize. There are many great places to eat in Duck and the Outer Banks but if you want to stay in and cook, the kitchen is fully stocked with plenty of pots and pans, dishes and silverware. There is a microwave, blender, and a new coffee maker for guests to brew a fresh pot or take advantage of the dual offering for K-cups so everyone can bring their favorite brand of coffee or tea to enjoy. There is a gas grill by the pool and a charcoal grill in the back for barbecues. Enjoy free Wi-Fi and cable, along with 3 TVs, a DVD player, games and a video/book library! Duck consistently ranks high on the Travel Channel’s annual America’s Best Beaches list and has been on the best beaches list since 2000. Drive, bring your bikes, or walk on the pedestrian path to downtown Duck and enjoy all the town has to offer. This convenient location puts you less than 1 mile away from the Village of Duck where you’ll find fresh seafood, a gourmet market, a produce stand, women’s boutiques, bike rentals, amazing restaurants, water sports gear and outdoor clothing, great bookstores, toy stores, art galleries, gift shops and so much more. All of the stores are locally owned and operated and so close together that shopping can be an all-day event on foot! Scarborough Faire Shopping Center features unique shops and eateries, and also delicious restaurants like Fishbones Raw Bar & Restaurant and Roadside Bar & Grill! For more upscale dining there is the Blue Point Grill, the Paper Canoe and the Sanderling Resort. Or opt to head South to the Aquarium and have lunch on the way back at Johns Drive-In, a classic drive-in shack (open May-October) specializing in thick milkshakes, burgers and fried fish sandwiches located at milepost 4.5. Go North to visit the lighthouse, play a round of Mini Golf, enjoy some ice cream or see the Wild Horses of Corolla, take lots of pictures but remember not to feed the horses! Why wait? 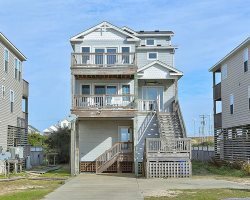 Call today to book your stay today at Luna Blu Cottage in the Outer Banks!